Even before she had a groom in mind, Katie Breland Hughes knew she wanted to walk down the aisle at her wedding on her own two feet. It became one of her initial goals after a horrific car accident left her paralyzed from the waist down. But first, she needed to survive her injuries. “Honestly, I had so many skin graft surgeries and so many burns, my first goal was just to sit up in the bed," said Hughes, now 27. "I was literally at rock bottom." In October 2011, the Louisiana personal trainer and physical therapy assistant missed a stop sign while driving home from an appointment with a client. A truck hit her vehicle broadside, and Hughes went flying through her windshield. She landed in a ditch and, seconds later, her burning car landed on top of her, searing her back. Conscious throughout the ordeal, Hughes knew she was either paralyzed or that her legs were amputated because she couldn’t feel either one. “Immediately, I started asking myself all the physical therapy questions. Is my spinal cord severed? What kind of injury is this? How far up? How low down?” she recalled for TODAY.com. At the hospital, doctors told Hughes that she would never walk again. But during a nine-hour surgery to insert rods and plates along her spine to stabilize it, they learned that Hughes' spinal cord wasn’t severed as they originally thought. After her 100-day hospital stay, Hughes went home and immediately started training. An athlete all her life —she was supposed to run a marathon the week after her crash — exercise had always given Hughes an emotional outlet. After the accident, her love of exercise proved critical to her recovery, and to attaining the new goal she had created for herself. Hughes heard about a Michigan trainer who had worked with other paraplegics. She reached out to him and flew to Michigan to begin training. “The first time I talked to her on the telephone, she was like, ‘Look, I don’t want to be in this chair forever. I understand what happened to me, but I want to work hard and see where I can get,’” said Mike Barwis, a strength and conditioning coach who frequently works with Olympic and professional athletes. It was during a session with Barwis that Hughes moved her legs for the first time since the accident. Meanwhile, Hughes had reconnected with a former acquaintance, Odie Hughes. She initially worried about meeting him again now that she was in a wheelchair. Within three months, they were engaged. Hughes started the clock: She had nine months to get on her feet. Barwis said he had no doubts they could make it happen. But while working to build up the strength in her legs, Hughes also had to plan a wedding. She also opened a gym she started in her community of Bogalusa, about 70 miles north of New Orleans. There was also the issue of finding a wedding gown. “I actually bought three dresses. I didn’t like any of them,” she said. After getting ready to settle on one of them, she received a call from the cable network TLC, asking if she wanted to be featured on the show, “Say Yes to the Dress.” Hughes flew to the Atlanta bridal store featured on show (the episode airs Jan. 2) and finally found a gown she was happy with. Except she never practiced walking in it until the day of her wedding. "I didn’t want anybody to see the real one," she explained. So instead, she practiced using one of the other gowns. She started in a full-body brace, then with a walker before moving on to two canes. Finally, she used two leg braces that went up from her feet to just above the knees, all while holding on to a person on each side of her. 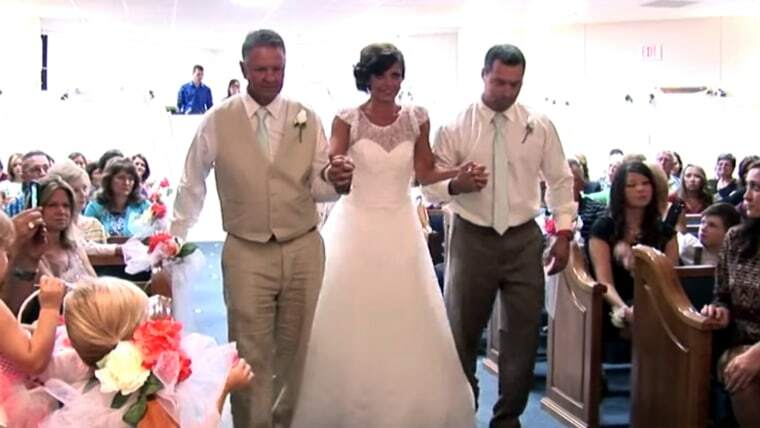 On her wedding day, Sept. 20, Hughes walked down the aisle, on her own two feet, holding the hands of the two men giving her away: Her dad, who stood to her right, and Barwis, on her left. As excited as she was, Hughes said she never anticipated the nerves she experienced as she stared down the aisle at her guests. Waiting for her there with a huge smile was her fiance. "When her foot caught that slip my heart stopped. But she just held it together like a champ," said Odie Hughes. "I had complete faith in her." He said he never for a second doubted the woman he considers "the most stubborn person I know"
"When she said she was gonna do it, it was a done deal," he said. "Never one doubt in my mind she'd not only make it down the aisle but she'd do it in dramatic fashion. That's my Katie." Months later, Katie is back at work, keeping busy with her physical therapy patients and running her gym, Katie's Shed, where she teaches various cardio and full-body workout classes. She enjoys newlywed life and said it helps to have a partner who is familiar with life-altering injuries: Her husband once broke his neck during a car accident that left him with metal rods in his legs. Hughes still uses her braces, alternating between them and her wheelchair, depending on the circumstances. She speaks at local and regional events about her accident and hopes her story will inspire others to reach beyond traditional expectations. Hughes will be featured on the season debut of TLC's "Say Yes to the Dress: Atlanta" on Jan. 2.